events and activities for all ages. Despite its foreboding moniker, the Great Dismal Swamp is one of few remaining American wildernesses and is home to black bear, bobcats, river otters, rattlesnakes and many rare plants. It is the largest intact remnant of a vast habitat that once covered more than one million acres of southeastern Virginia and northeastern North Carolina. Especially attractive to birders and nature lovers, the Great Dismal Swamp boasts 200 species of birds, yellow-bellied and spotted turtles, lizards, salamanders, frogs and toads. Despite its impressive size and age, the Great Dismal Swamp remains a mystery to most people. Its thick forests protect its wildlife and ward off intruders. But for those who venture in, the Dismal Swamp shelters a wealth of history and lore, flora and fauna. Visitors may participate in hiking, biking, nature photography, wildlife observation, hunting, fishing and boating. One of Suffolk’s most popular attractions, narrated Swamp Safaris fill up quickly. The four-hour tour is led by a biologist specializing is the unique habitat of the Great Dismal. Learn about the history, lore, vegetation and wildlife with this adventure that includes a brief walk to Lake Drummond. Sunscreen, insect repellent, comfortable clothes and shoes are recommended.​ A small snack and beverage is provided. This tour is not recommended for very small children. After a string of garden gnome disappearances in London, Gnomeo & Juliet team up with legendary detective Sherlock Gnomes and his assistant, Gnome Watson, to investigate the mysterious disappearance of their missing friends and family, leading them to believe Sherlock's nemesis, Moriarty, may be involved. Prepare for an adventure into the great un-gnome with this fun family film featuring original music by Elton John and Bernie Taupin! Originally constructed as "Green Hill Cemetery," this 32-acre expanse of hilly terrain and ancient cedar trees has many stories to reveal. Located behind Riddick's Folly House Museum, Cedar Hill Cemetery (1802) is an official site of the Virginia Civil War Trails program, as it is the final resting place for many Confederate generals and soldiers. 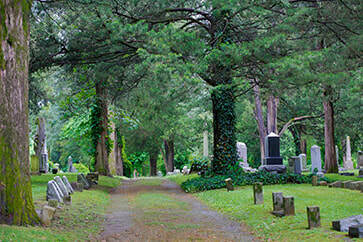 Enjoy a 60-minute stroll of Cedar Hill Cemetery's historically fascinating and hauntingly beautiful grounds. After a mission goes wrong and anarchist Solomon Lane escapes custody, Ethan Hunt and his IMF team are blamed and their loyalty is questioned. They attempt to fulfill their initial mission and recapture Lane while also trying to outrun a ruthless CIA agent tasked with taking them out. As Hunt fends off these old and new threats, including an imminent nuclear attack, he also realizes allies within IMF might have other motives. An all-star cast made this exciting thriller a huge box office hit with critical praise. A hair-raising encounter with the “spirited” side of Suffolk. Follow a costumed guide through the shadows of historic Main Street discovering stories, legends and “unexplained occurrences” by lantern light. Tales of unsolved mysteries and unresolved affairs abound throughout Suffolk’s historically hip Ghost Walk. Not appropriate for children under 9.